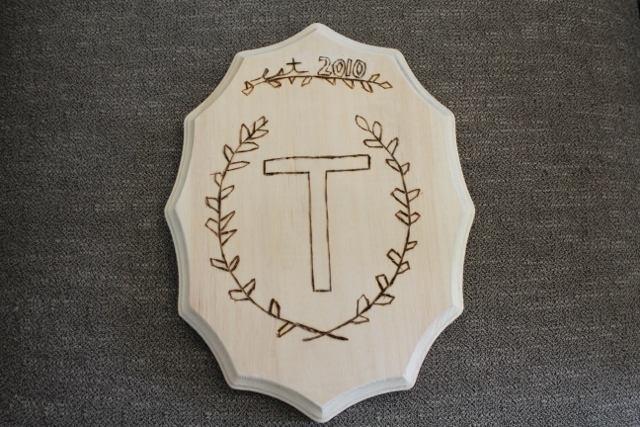 As promised, today I’m sharing what I made for Dan as part of his 5th anniversary gift – a modern family crest. I’m actually really happy with the way it turned out. I was really nervous when I started, and didn’t think to buy an extra wooden plaque in case I messed up! So how did I make it? I’ll start at the beginning. The wooden plaque is from Michael’s. It was in their wooden section, with all the other wood pieces like letters and birdhouses. I thought the shape was really cool – it certainly wasn’t your standard square or rectangle. The only thing was, the cut made the wood super splintery, so it took quite a bit of time to sand it down as much as I could. Next, cue the woodburning pen. 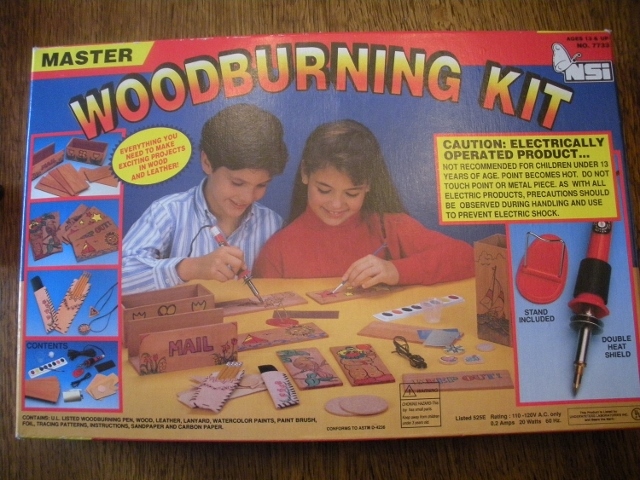 I imagine you could pick one up at any craft store, but I actually had one from an old Woodburning Kit that I got as a kid. I thought the pen would be super difficult to use. I didn’t remember having much success with it in childhood. But actually, it wasn’t too bad. I’m sure you could freehand your design, but since I have zero spatial sense and terrible penmanship, I went ahead and used some printed graphics as a guide. For the T, I just played around with different fonts in Word until I found a font I liked (Corbel, in size 400). I wanted to make the plaque look like a modern style family crest, and when I saw these prints with wreath-like leaves, I knew it would look great. 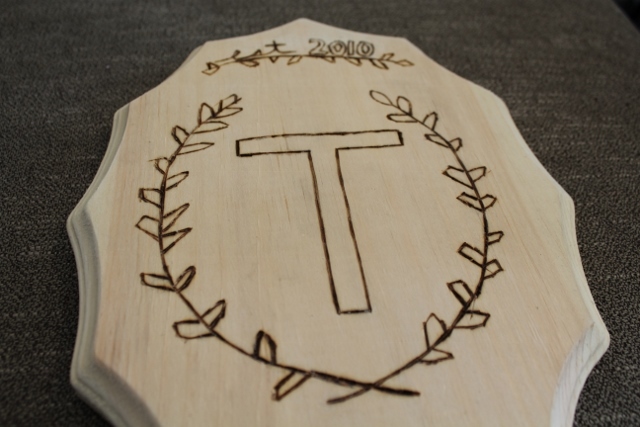 I wish I took a picture of it (too into the project I guess), but I just cut out the T and the wreath separately and placed them on the plaque until the spacing looked right to me. After using this technique of scribbling pencil on one side of the paper, I used some tape to secure each piece of paper in place to trace out the letter and shapes. Once I had the pencil lines in place, all I had to do was trace with the woodburning pen. When I finished, I knew the plaque still needed something. That’s when I realized the top was looking pretty bare, I realized I would have to freehand something. Gulp. I decided to add in the year we got married. So, I took a pencil and, in my best cursive, wrote “est.” I wanted the 2010 to look a little different than the “est.” so I thought I’d put it in block lettering, like the T. It still wasn’t quite right, so I added in another branch with leaves. Then, I started tracing over the pencil with the woodburning pen. I didn’t always follow the pencil line exactly, so when I finished burning the wood, I used an eraser to try to hide all my mistakes. Well, as many mistakes as I could. If you look closely, you can see a few places where my woodburning pen got away from me a little bit. I think it just adds charm to the piece. Right? I toyed with the idea of painting the sides of the plaque, considering using black or aqua, but neither seemed right to me. The natural blonde wood with the darker woodburning were great contrasts to each other, and bringing in some non-natural color just wouldn’t look right. In the end, I gave it to Dan as it appears above, without paint. Dan really liked it. I asked him if he wanted me to pain the edges, but he agreed that it just looked best in its natural state. We’re not sure where we’ll hang it yet – maybe in our gallery wall, or maybe upstairs in the hallway – but I’m just so pleased with how it turned out. I really liked woodburning (once I got the hang of it), and I’m looking forward to trying my hand at it again soon.